With hours of daylight decreasing and inclement weather a frequent occurrence, the fall season is a time when drivers need to pay a little more attention to road and traffic conditions and use extra caution while driving. Here are some safety driving tips that can make the fall season more enjoyable and trouble-free. Slow down. The faster you drive, especially on wet, slippery roads, the longer it takes to stop your vehicle. Doubling the speed of your car can nearly quadruple the amount of time required to stop safely. Buckle up. Most drivers do this automatically, but there are times when this safe driving practice is forgotten in the haste to accomplish errands, get home or to a destination. The fact is that a seatbelt is your best primary protection against injury in a sudden stop, emergency maneuver or vehicle crash. Always buckle up and make sure your passengers do likewise. Put the phone down. Driving down a deserted road or the highway with little traffic might seem boring and there’s that call or text you want to make. Don’t. In most states texting is against the law, and studies have shown that talking on a cell phone, even hands-free, is a driver distraction. Your mind isn’t on driving when you’re discussing sports, what to eat for dinner, the kids’ latest escapades or just chatting in general. If you have to make or take a call or text, pull over to a safe location, park and then proceed to talk/text. Give a hoot–watch out for wildlife. According to the AAA, collisions with animals resulted in 2,083 fatal crashes and 2,194 fatalities between 2001-2011 nationwide. To avoid a collision with deer and other wildlife, says the AAA, follow these precautions: scan the road and shoulders ahead of you; use high beam headlights if there’s no oncoming traffic; if a collision can’t be avoided, apply brakes firmly and remain in your lane; be extra cautious at dawn/dusk; slow down and be extra cautious when traveling areas with high and active wildlife population, always wear a seat belt and stay awake, sober and alert. Use your headlights. If your vehicle doesn’t have daytime running lights, turn on your headlights at dawn and dusk. Other drivers need to be able to see you and vice-versa. Using your headlights when the light is dim or fading also helps you identify hazards in the road, pedestrians, animals and other conditions you might not otherwise see until it’s too late. Make adjustments for fewer hours of daylight. Be on the lookout for children playing, at bus stops in the morning and afternoon, people walking dogs, pedestrians, runners, power walkers, joggers and bicyclists. Pay attention to weather forecasts. If a storm is expected, be prepared for quickly changing road conditions. Heavy winds mean leaves blowing across the road surfaces, which makes it more difficult to see potholes and other road hazards. As temperatures drop, frost often forms on roadways, causing hazardous driving. Drive slowly and break gently on overpasses and bridges, which tend to frost over quicker than other road surfaces. Watch out for areas where black ice forms. Bottom line: Fall is a beautiful time of the year, but it can present challenging driving conditions. Use common sense and extra caution to ensure everyone’s safety. 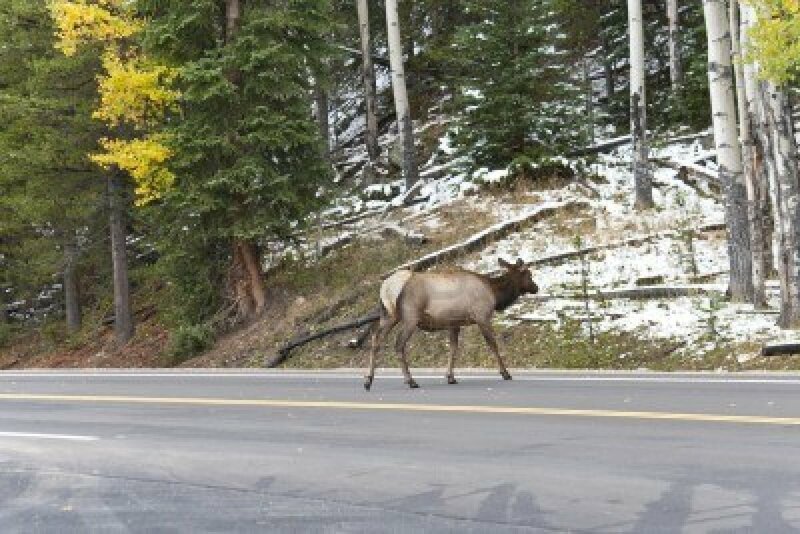 deer crossing road, driving safety tips, elk crossing road, fall driving, safe driving. Bookmark.